Along with a near year, I’ve so many new products to try! With my birthday money and presents for Christmas I got afew new products so I’ve been trying them and loving them so I had to share them. Trying new products is so exciting and especially loving them it’s a massive bonus because I use so many different products every day and I can use new ones in the mix and find new holy grails so it’s so enjoyable. I never try new eye primers but I’ve noticed that I had afew mini ones at the back of my drawer. I want to use my product so I opened the Too faced eye insurance and this is amazing! It’s a slight tint to it and it makes my lid tacky so my shadow sticks and lasts all day without creasing. The last primer I used began creasing so this is such a relief it works! I’ve heard a lot about Sephora’s Own brand and never tried it till I received it till Christmas I got the palette in ‘the enchanting glow’ and this is a base palette and I’m in love. The colours are perfect for me (well one highlighters too dark) but it’s perfect for travelling as it bronzer, blush and highlighter in 1 so it’s so quick and easy to use - plus it’s go a mirror! Fresh is a brand I wanted to try for so long! It’s had so much hype and it was dying to see why and once I got the sugar lip balm I saw why. This little lip balm is so soft and buttery, you can feel how luxury it is and I’ve never wanted to spend £20 on a lip balm as much as i do when I buy this! I love how the formula is so soft and silky, helping save my lips from the awful cold weather. And another lip product that’s helping this too is the primark x alex steinherr overnight lip mask and this is like the cherry on the top of my lip saviours! It’s such a thick formula that soaks into my lips and helps hydrate them so much - I never wake up with dry lips when I use it & it leaves a gorgeous rose tint. Personally I think this is my winter saving grace and I love this - I’m already half way though. 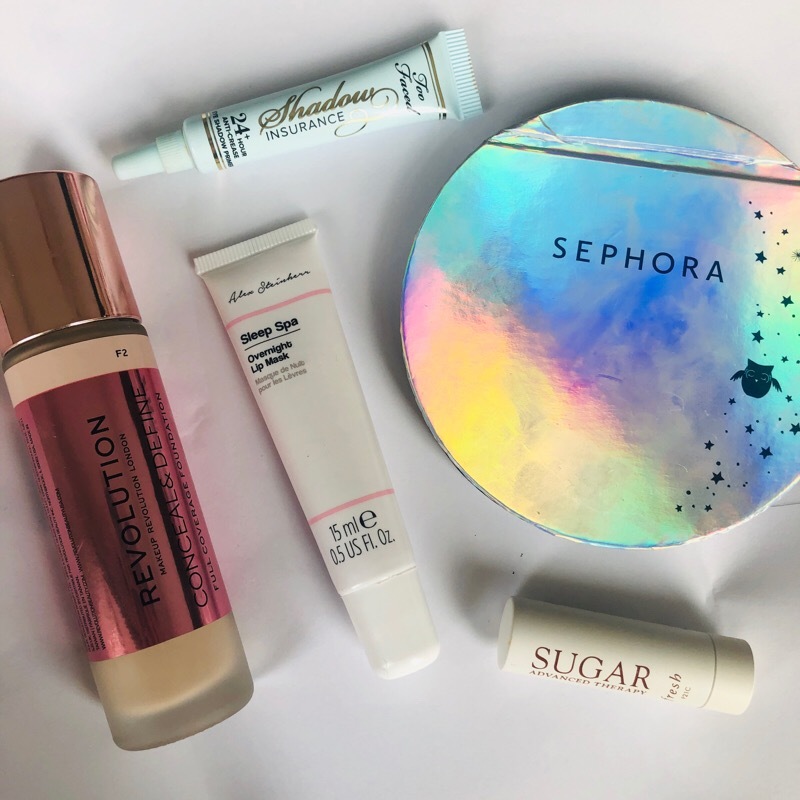 All of these products have blown me away and I’m so glad im able to try them! I can’t wait to use them more and them possibly even be holy grail in afew months time! I love product reviews! I have had a hard time reminding myself to try new things but I definitely think I will need to head out and find the overnight lip mask! Thanks for the suggestions! I love revolution brand so much! Have you tried their eye shadow? It's so good. I will try the eye primer though I really struggle with creasing. Great post!! Literally, I'm late to every trend too! I'm really glad you like the Too Faced Shadow Insurance because I've been contemplating getting it or not. I really like Too Faced products so I'm sure this one will be just as good. Great post girly!! That sephora one just draws you in with is look! I want to use it asap! I have a Kat Von D one that looks similar and I love it! Lovely review. These seem like great products. I need to try a few of these! These all look great! I have the revolution foundation and it’s amazing! Might have to invest in some Sephora products though! I have recently started using the revolution concealer and I love it. I actually prefer it to the cult classic collection lasting perfection concealer. It doesn't crease or oxidase!